In their absence, shattered windowpanes and chipped paint, boarded windows and dark hallways are mainstays at the expansive, 1,000,000-square-foot former industrial powerhouse that once churned out textile machinery used around the globe. Since its doors shuttered in 1980, plans to revitalize the massive, 77-acre property in the small town’s center — also a central piece of local history at the core of the town’s identity — have followed the same fate as the building’s storied past: They have come and they have gone. But the latest pitch from town officials, a nearly $50 million Urban Renewal Plan dubbed “Draper Falls” that calls for potentially 565 housing units and 175,000 square feet of commercial space on the property and others under private-public partnership, has now pit them against the property owner, Worcester developer Philip Shwachman, in a battle that could take years to play out. 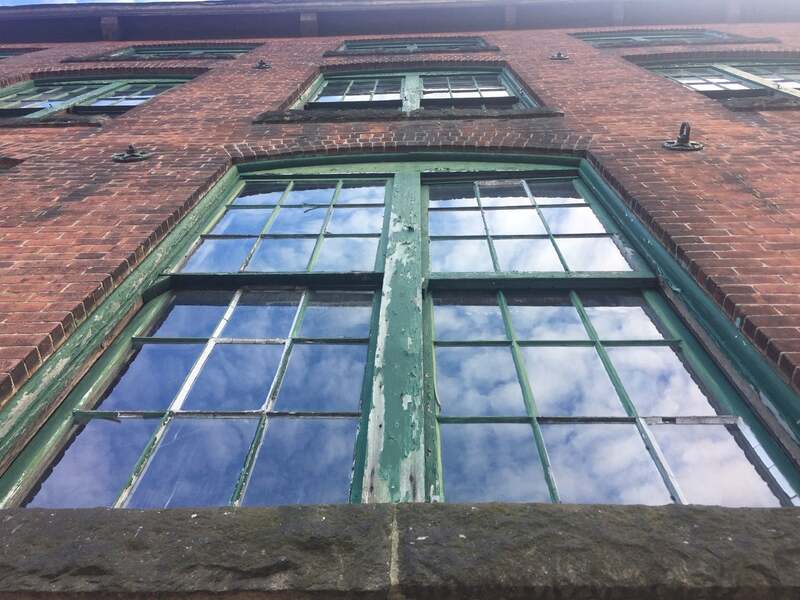 Windows of the former Draper Corp. factory look out onto scenic Hopedale Pond. In a lawsuit filed in Worcester Superior Court last month, Shwachman — who has acquired properties that make up the site over the last three decades — alleges the town, notably selectmen, conspired in closed-door meetings to take it all from him through eminent domain — without giving him any compensation. The lengthy and biting civil complaint demands that officials drop their plan on the basis that they violated Shwachman’s rights with disregard. Other allegations say officials repeatedly violated Open Meeting Law and deceitfully rammed the renewal plan through the local approval process, aided by the Grafton & Upton Railroad, which operates on adjacent property. “The town has acted behind closed doors in a rush to push through a poorly-conceived plan that proposes taking all of Mr. Shwachman’s property, and nobody else’s property, by eminent domain, and paying him nothing for it,” David Lurie, Shwachman’s attorney, told Boston.com in a statement. The Urban Renewal Plan, unveiled this summer, states however that the redevelopment of the property wouldn’t be possible without government support, since after 30 years of Shwachman’s private ownership, little has changed. The town worked with Shwachman in 2007 to form a reuse plan — one that outlined how the site could become a mixed-use development filled with offices, shops, and homes — but it was never put in motion. The current Board of Selectmen told residents last year about a renewed effort they were spearheading to build upon that plan with new additions that would consider the use of the adjacent Grafton & Upton Railroad rail yard. The railroad, which was dormant before returning to local service in 2013, would be a key component of Hopedale’s future, Selectman Thomas Wesley said at the time. He told The Boston Globe in August that Shwachman has “put a stranglehold on the development of the town” as his property, a stone’s throw away from downtown Hopedale, sits empty and undisturbed. Officials have said redevelopment would additionally provide a major boost to tax revenue, potentially joining an effort the town, currently with limited commercial tax revenue, has undertaken in recent years to grow its tax base. Selectmen delved into crafting the Urban Renewal Plan over the past year and unveiled it earlier this year. Calling the property a “scar across the center of Hopedale,” the plan identifies 16 Shwachman-owned parcels the town would need to acquire to see its vision through. The project, altogether, would span 26 properties. Shwachman was never offered a seat at the table during the process, even after asking selectmen to be included, according to the lawsuit, which cites emails between selectmen. The railroad, owned by Jon Delli Priscoli, meanwhile gave planning and consulting services to the town for free without a chance for public bidding, the court filing says. “The people of the Town of Hopedale were merely collateral damage to the Selectmen and their quest to destroy Shwachman,” the document reads. The complaint alleges railroad leadership had a guiding hand in how selectmen and other officials should carry out the plan, and how they should push it along. Delli Priscoli, who bought some parcels from Shwachman, had talked to Shwachman in 2012 about buying other parts of the site, but didn’t have the capital to close the deal, according to the lawsuit. The two parties later swapped some parcels in a “more modest transaction” in 2014, the complaint reads. Requests for comment from Delli Priscoli and Lobisser, both named as defendants among 19 in total in the lawsuit, were not returned. Selectman Brian Keyes declined to comment when reached by phone, and inquires to Town Hall were directed to town counsel, which did not return multiple requests for comment from Boston.com. Wesley, speaking at a selectmen meeting Monday while addressing concerns from Water & Sewer Commission members about the water infrastructure required for such a development, said the plan is just a draft. He said officials, right now, are “miles away” from eminent domain, which he called a last resort option, and added that they are still pursuing the urban renewal planning process, although there are “revisions envisioned” for the plan. “We’re no where near submitting this thing (to the state) yet either,” he said. 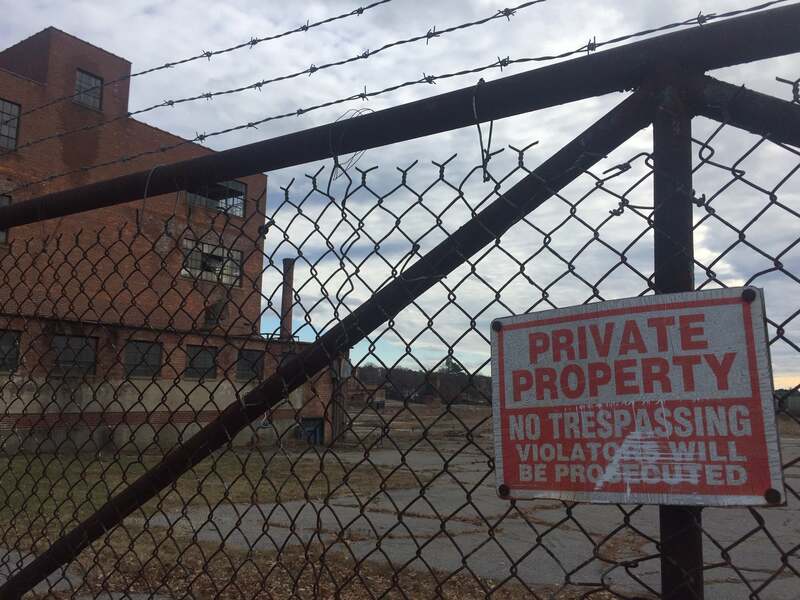 The former Draper Corp. complex, as seen from a locked gate behind the factory. Asked why Shwachman has yet to develop the property himself, Lurie blamed the inaction of town leaders and said Shwachman was onboard with the 2007 study but it was local officials who let the plan gather dust before their latest effort was made in secret this year. Shwachman, through the lawsuit, says he has spent over $10 million cleaning environmental hazards on the property, demolishing unsafe structures, and providing staff to monitor the site. The lawsuit states Shwachman was “frustrated by the lack of cooperation from the town” by 2016 and indicated to officials he intended to put the property up for sale. The site was ultimately put on the market in October this year, months after the Urban Renewal Plan was revealed. The town had 20 days to file a response to the complaint in court as of its Nov. 20 filing. Other documents on file in court indicate that should the case move forward, the two sides may not hear a judgment until November 2021.